The option greeks are risk metrics which show how an option would react to changes in the base price, the volatility, the interest rate and other parameters. The greeks are called so, because they are usually named after letters of the greek alphabet: delta, gamma, theta, rho, etc. One notable exception is vega, which is not named after a greek letter, although it has an alternative greek name: kappa. 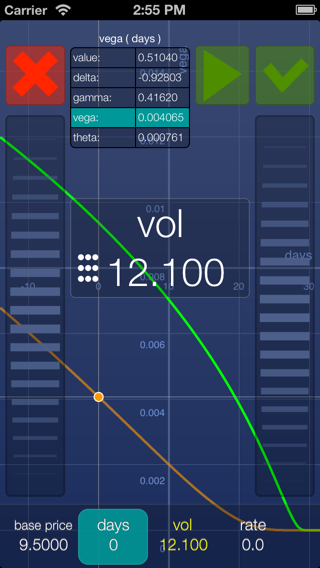 - theta measures how the option price changes with the passage of time, as the option gets closer to the expiry. Other greeks and greek-like risk parameters include rho, charm, speed, volvol and many more. Most greeks are interrelated in a somewhat tricky way, with changes in one basic parameter affecting several greeks in a different manner. The greeks can change with changes in the base price, volatility level, interest rate or simply with the passage of time. In this study you can see how the vega of a put option changes with time.